Airport Security Made Me Feel Cheap and Easy! I fly a lot…I mean A LOT! As a matter of fact I’m 30,000 feet in the sky right now! See!! Don’t we look happy? 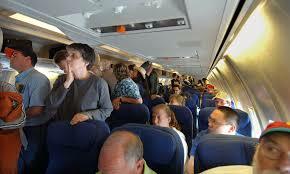 Air travel can be a little rough, but getting through the airport with its long lines and security checks can be extremely stressful. Everyone loves getting screamed at by TSA agents when traveling because you have loose change in your pocket. And then of course, there is the infamous pat downs and prohibited items in your bags. Read below for a few random thoughts on airport security. Yesterday I received a pepperidge farm gift basket in my hotel room. Word to the wise…do NOT carry large sausages in your carry on bag through airport security. 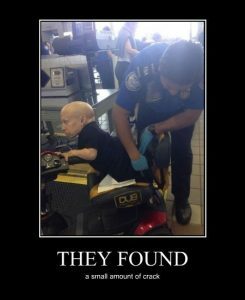 TSA agents tend to think its something else entirely. Save yourself the embarrassment! 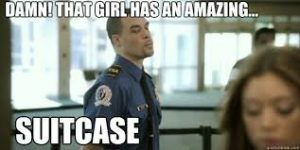 Thank God for the TSA’s airport body scanners, though. Apparently I have a hernia and didn’t know it. The TSA agent offered to explore it while I turned my head and coughed. Things not allowed on a plane: Always remember: The TSA does not allow Liquids, gels, aerosols, creams, pastes, dynamite, batteries, fireworks, fire extinguishers, chlorine, blasting out caps, paints, fuels, hand grenades, selfie sticks, certain children, or smoked kielbasa. 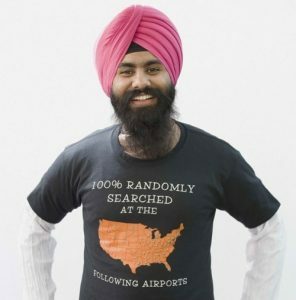 For a funny and bizarre list of items that have been confiscated by the TSA take a look at this list! Flying Moms BEWARE! — Attention, mothers with newborns – pumping a little milk before you travel could end up wasting more time than it saves. Elizabeth McGarry, a New York mom on the go, tried to board a flight from JFK late last year with three bottles of expressed breast milk in her carry-on luggage. Previous articleHow Well Do You Know the Liberal Lexicon?